The nineteenth century was an era of breathtakingly ambitious geographic expeditions across the Americas. The seminal Chorographic Commission of Colombia, which began in 1850 and lasted about a decade, was one of Latin America’s most extensive. The commission’s mandate was to define and map the young republic and its resources with an eye toward modernization. In this history of the commission, Nancy P. Appelbaum focuses on the geographers’ fieldwork practices and visual production as the men traversed the mountains, savannahs, and forests of more than thirty provinces in order to delineate the country’s territorial and racial composition. Their assumptions and methods, Appelbaum argues, contributed to a long-lasting national imaginary. What jumps out of the commission’s array of reports, maps, sketches, and paintings is a portentous tension between the marked differences that appeared before the eyes of the geographers in the field and the visions of sameness to which they aspired. 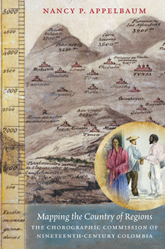 The commissioners and their patrons believed that a prosperous republic required a unified and racially homogeneous population, but the commission’s maps and images paradoxically emphasized diversity and helped create a “country of regions.” By privileging the whiter inhabitants of the cool Andean highlands over those of the boiling tropical lowlands, the commission left a lasting but problematic legacy for today’s Colombians.